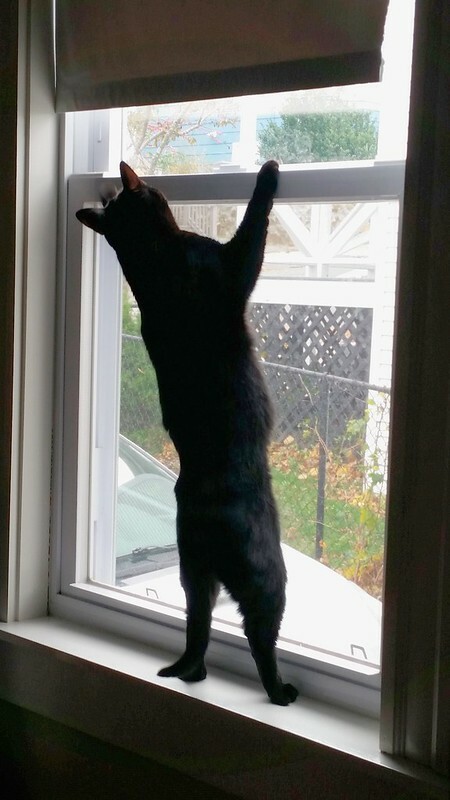 Bear the cat is standing up on her hind legs on the windowsill, trying to bat at leaves outside. Both of my cats are characters, but Bear gets an awful lot of laughs from her attempts to interact with the outside world. Whether she's chirping away at birds outside in hopes of seducing them for dinner, growling and getting all puffy to warn away another cat passing by, or, as in this case, bouncing at the window to attack the leaves that are flittering by. I get that treating pets as people can be seen as insulting, but with two cats with such distinct personalities in terms of what gets them excited, how they express their affection, and how they engage the humans of the household, it's hard not to recognize them as sentient in some capacity and appreciate them all the more.